Last week a friend and I took a daytime trip to photograph the closed and abandoned Geauga Lake Park. This park which closed in 2007 is now sitting overgrown and falling into disrepair. The park was tightly fenced and secured and the fencing was covered with a dark screen. I’ve seen some photos taken from inside the fence however at my age I was not inclined to attempt to climb the fence to get inside. No Trespassing signs were prominently displayed all along the fence. We walked along outside of the fence shooting thru holes in the screening and thru spaces where there were hinges for gates. This photo was shot in full daylight thru one of those spaces. The photo of course no longer looks like it was shot in full daylight! 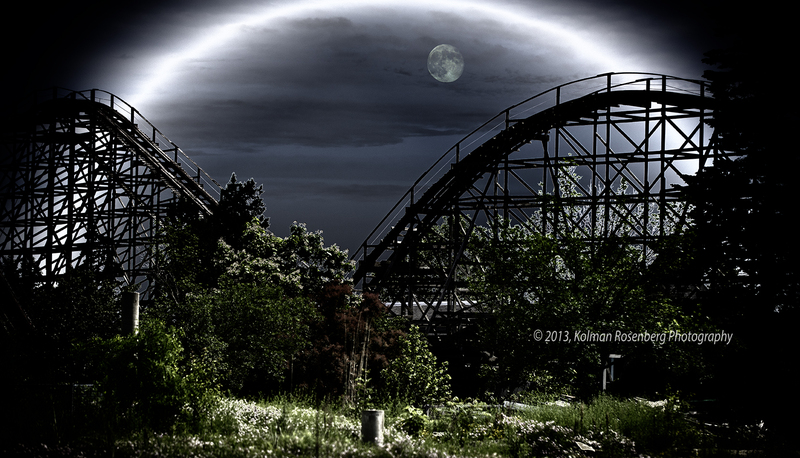 Some creative effects were added with NIK software to give the photo an erie nighttime kind of look which to me went along with my desired theme of a scary valley of thrills. Initially I left the photo like that for a week but then with news reports all week of the supermoon being visible this weekend, I decided that the photo needed a moon. I have a selection of moon shots from the past and rather than trying to shoot the super moon, I decided to add one from the past. It fit in nicely. The rest of the story involves further shooting from the parking lot area and in front of the shuttered old entrance gate where just as we were leaving we were discovered by park security and firmly told to leave! We kindly obliged but were glad we got our shots! This entry was posted in Uncategorized and tagged abandoned, amusement, aurora, coaster, Decay, geauga, lake, moon, night, OH, ohio, park, Roller Coaster, scary, valley. Bookmark the permalink. You got a very good photograph despite all the obstacles you encountered. It seems there are “no trespassing signs” everywhere these days. Here in the country it seems as if every farm has one on their fences or outbuildings and barns. Finding and taking a good and interesting photograph is not as easy as it may seem. Like you I am not as able to take risky and physically demanding challenges to accomplish that. I thought the signs applied to inside the fence! We were in the parking lot area when told we were trespassing, technically true I guess but I didn’t see any signs in that area! Oh well, still able to get a few interesting photos! I’ve noticed the signs everywhere too! I guess in our society liability rules today!